If you’re searching the internet for information about buses from Málaga airport heading to the eastern Costa del Sol, here’s the current situation for Summer 2014 (until 28th August). Yes, there´s good news for visitors arriving at Málaga airport who don´t want to hire a vehicle to continue their travels. During the summer months, Alsina Graells (ALSA) operate an airport bus service along the coast between Málaga airport and Maro, with lots of stops along the way. The bad news is that the service only operates twice a day in either direction, though that’s twice as many buses as there were last year – so I guess there is some progress! Starting in Maro ten minutes before, the bus leaves Nerja at 8.10am and 3.10pm, and calls at Torrox Costa, El Morche, Lagos, Mezquitilla, Caleta de Vélez and Torre del Mar before proceeding to the airport without further stops (arriving at 9.40am and 4.40pm respectively). The cost (from Nerja) is €4.52 one-way (ida) or €8.18 return (ida y vuelta). Although there are only two buses each day direct from the coast of the Axarquía region to Malaga airport – don’t let this worry you. There are plenty of buses ALL YEAR ROUND to Málaga bus station in the city centre, from where you can get another bus to the airport. This second bus (every 20 minutes) will drop you off right outside the new terminal (T3) building. If you prefer to continue your journey from Málaga city to the airport by train, right next door to the bus station in Málaga is the Maria Zambrano railway station, where you can jump on one of the frequent trains direct to Terminal 3 of the airport. You will need to catch the local commuter train (known as Cercanias) C-1 in the direction of Fuengirola. Trains to the airport leave every half hour between 5:23am and 10:33pm. The journey only takes 10 minutes and the fare costs between €1.70 and €2.60 depending on the time and day of travel. The journey on the direct-bus to the coastal areas of the Axarquía begins at Málaga airport, Terminal 3 (Arrivals Llegadas) at 11.45am and 5.15pm travelling via Torre del Mar, Caleta de Vélez, Mezquitilla, Lagos, El Morche, Torrox Costa and through to Nerja (arriving at 1.20pm and 6.50pm respectively). The service actually terminates in Maro ten minutes later. 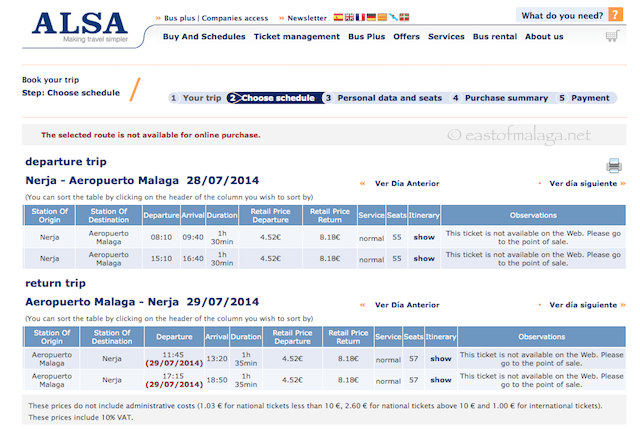 The cost (to Nerja) is €4.52 one-way (ida) or €8.18 return (ida y vuelta). If the limited direct-bus times don’t fit in with your schedule, then just hop on the C19 Malaga city bus (every 20 minutes) from right outside Terminal 3 and for approx.€1.20 you’ll soon be at the Estación de Autobuses (bus station) in the city, from where you can catch a bus to anywhere in Spain (including other towns and villages of the Axarquía). Alternatively, to get into Málaga city from the airport, jump on the local train (the station is just across the road from the bus stop) heading towards Málaga Centro and get off at Maria Zambrano railway station (the journey takes approximately 10 minutes and costs between €1.70 and €2.60 depending on the time and day of travel). The bus and railway stations in Málaga city are next door to each other. The Alsina Graells (ALSA) website is in English, where you can study bus schedules and often purchase tickets in advance of your trip. Disclaimer: It says on the ALSA website “These timetables are for guidance purposes only”, so please check the times before you travel as they may be subject to change. This entry was tagged Andalucía, East of Malaga, Europe, life, Malaga, Nerja, Spain, travel. Bookmark the permalink. Yes, it IS still running this year, but it’s quite difficult to get hold of the details. The Alsa website is showing the bus throughout the summer, but seems to finish before the end of August. It MAY still be running at the beginning of September – but there are only one or two buses each way, each day. There is one at 11.45am leaving the airport – but if your flight times don’t coincide, it’s easier for you to get the bus or train into the centre (the train station is next door to the bus station in Malaga) and then get the onward bus from there (of which there are plenty). I hope the tourist board knows what a good job you do Marianne! I love the public transportation here; that’s what we use lately when we travel anywhere. Would just rather not drive, at least initially when getting to a new destination. Great info for those headed your way. It’s Italy and France this year for us. We often get the bus from this end to the airport at Malaga, from Estepona and it also picks up at Marbella. Hate driving on the motorway and tolls are really high in the summer.